“The subject of Sonia Krestchmar’s portrait, Sydney-born author Cassandra Golds, writes books for children and young adults. Her writing has been described as part parable, part surrealist fable and part love story. Kretschmar first became familiar with Golds’s work when she was commissioned to illustrate the cover of her novel Clair-de-Lune for Penguin Books in 2004. Since then she has illustrated two other novels by Golds: The museum of Mary Child (2009) and The Three loves of Persimmon (2010). 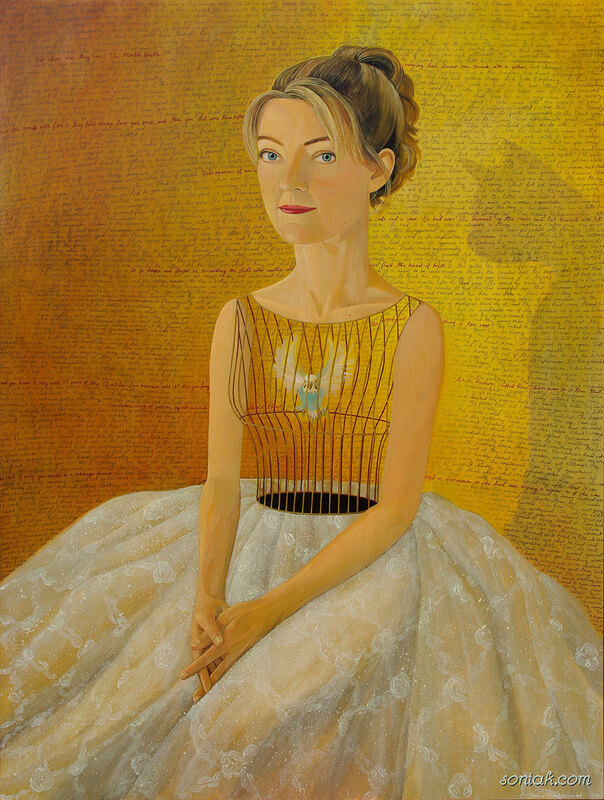 ‘After getting to know her (via Facebook), and in celebration of her recent achievements of being shortlisted for both The Prime Minister’s Literary Award and The NSW Premier’s Literary Award, I thought the time was right to paint her portrait,’ says Kretschmar. ‘I met with her a couple of times last October, and had the chance to do some sketches as well as mull over the best way to represent her.